Welcome to the land of Golden Beaches. The soft sands and crystal clear beaches of Bentota allure you into relaxing body mind and soul. For the adventurous of spirit, there are water sports options galore. Or if you do not want to do anything but vegetate, there is the soft sands calling out to you. Whatever you pleasure, Bentota is sure to assuage it. We will receive you on your arrival to Bentota, help you check in and ply you with a lavish breakfast. Then we will take you out on a guided tour of the city. The prime attractions are a boat ride on the river Madhu and a visit to the Turtle hatchery. The Turtle hatchery was opened in 1981 in a bid to protect the turtle population. Baby turtles hatch and are helped along for the first week in their lives, before being released into the sea in the dark of the night. We leave you to your own devices on this day, but after making sure you enjoy your breakfast. Enjoy the beaches, explore the markets, taste the cuisine. Do whatever your heart desires. Enjoy your last day with us. We will take you to Colombo, the largest city on this tiny island. Check in to the hotel and after breakfast, we will show you around the city. A city which has retained its colonial era feel and yet blossomed into the commercial capital of Sri Lanka, Colombo is a mix of many things. Its architecture and cuisine bears testimony to its settlers, the Dutch, Portuguese and the British. The influences of multiple religions Buddhist, Hindu and Islamic are witnesses to the fact that Sri Lanka is a very tolerant country. 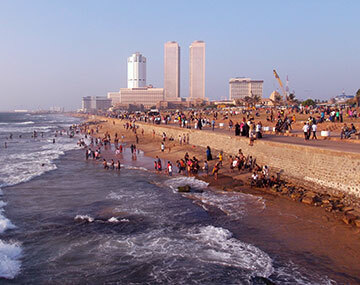 The guided city tour will take you across the Galle Face Green, the Viharamahadevi Park, National Museum, Twin World Trade Center towers, Old Parliament Building, Fort district and Independence Hall at Independence Square. Have a hearty breakfast at the hotel and then the day is yours to explore Colombo. Shop your heart out at the bazaars, climb the hills and savor the cuisine. After your breakfast, we will drop you off at the airport and wish you safe journey for your trip back to India. The Tourism Department of Sri Lanka calls the island the ‘Wonder of Asia’. This island country shares its maritime borders with India and Maldives. Nestled in the confluence of the Arabian Sea, the Bay of Bengal and the Indian Ocean, Sri Lanka is blessed with so much diversity by nature, that it is difficult to see every detail in a week’s time. This country hides within its 1340 km coastline eight UNESCO World Heritage sites,fifteen national parks showcasing an abundance of wildlife, over five lakh acres of lush tea estates, two hundred and fifty acres of botanical gardens, and many waterfalls and water bodies. Sri Lanka was under the colonial rule until 1972. Then it was rocked by civil war till the Sri Lankan Army defeated the Liberation Tigers of Tamil Elam (LTTE) in 2009. Now with peace reigning in this island, the spurt of economic and infrastructure growth is marvelous to see. The religious and indigenous diversity of the place makes it an example of tolerance. This island is mentioned in the Ramayana and the root of Buddhism on this island dates to the 9th century. Rooms at the respective hotels on a double or triple sharing basis. An AC vehicle with an English-speaking guide. Any additional services used in the hotels or during the tour, such as laundry, meals, vehicles etc. Charges incurred by early check-in and late check out. An additional cost of Rs 1518 will be charged as entry fees to Madhu River Ride and Turtle hatchery in Bentota and National Museum, National Zoo and Gangaramaya Temple in Colombo.